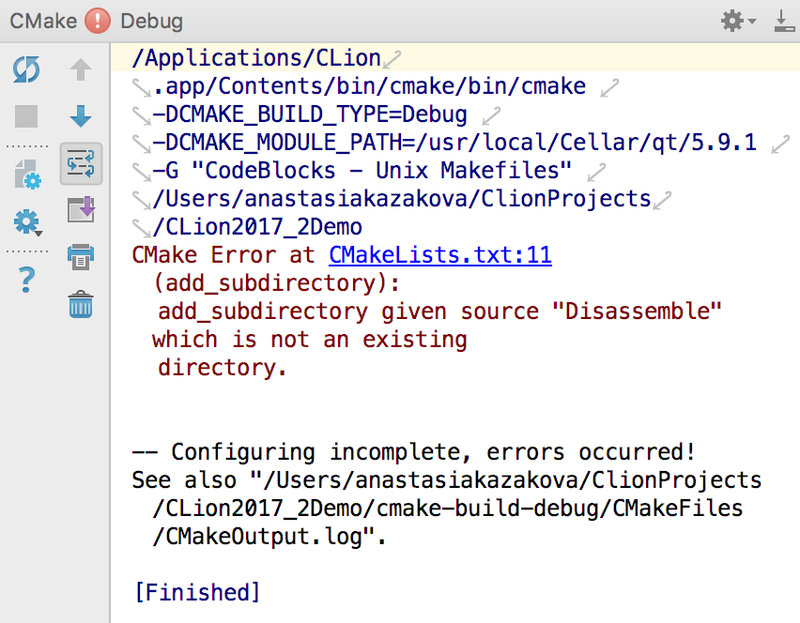 CMake remains the project model that’s most deeply integrated into CLion. point it to the existing generation folder or CMakeCache.txt files (this works only for Makefiles generator). 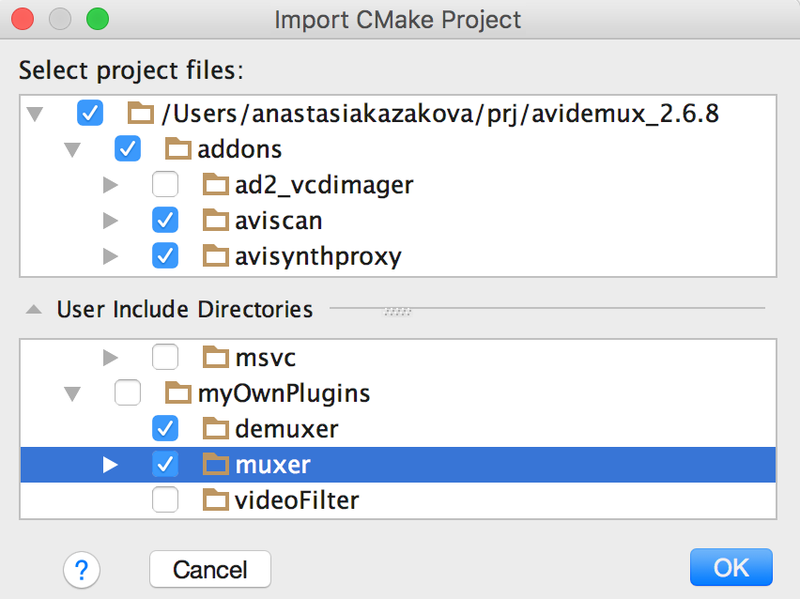 You can also import non-CMake projects (File | Import Project...), for which CLion will generate a CMakeLists.txt file. 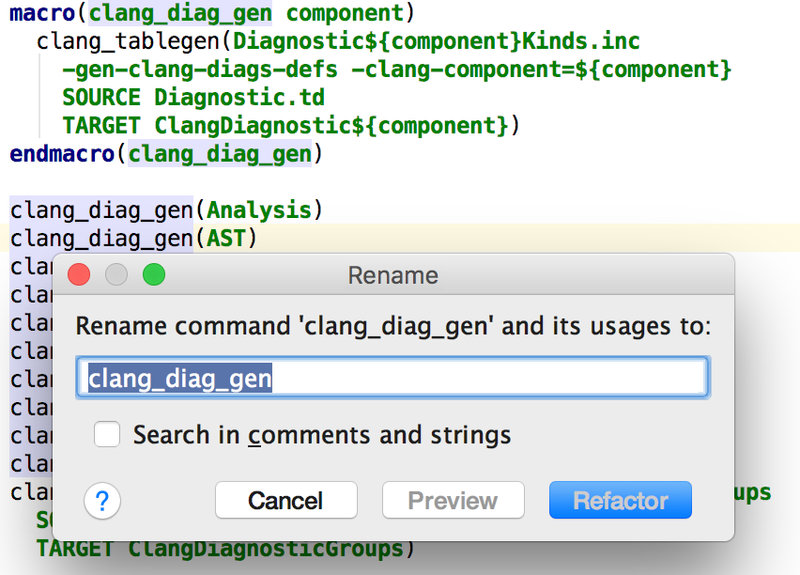 When adding a new file, CLion suggests to add it to the CMake target. When deleting files from the project, CLion removes the file reference from the command arguments, or warns you about a possibly incorrect command after deletion. In case you'd like to mark directories manually as libraries or project sources/headers, or exclude some directories (i.e. independently from the CMake project structure), you can do this with the Mark directory as feature. This will affect indexing (for example, you can exclude build directories, binaries, logs and generated data from indexing), along with code generation, refactorings and navigation. Find more details. With CMake profiles (Build, Execution, Deployment | CMake) you have control over CMake generation directory, CMake configuration types, CMake options and environment variables, etc. Create any necessary number of CMake profiles from scratch, or copy existing ones (with all the settings pre-filled). In case you have custom build types created by the setting CMAKE_CONFIGURATION_TYPES, they will appear in the Build type drop-down as well. Switch between CMake profiles in the run configuration switcher on the toolbar or in the Run (Shift+Alt+F10)/Debug (Shift+Alt+F9) configuration switcher popup. It also allows to open a CMakeCache.txt file right in the editor for further editing, like for example adding new variable to it. Reload CMake Project can be used to apply the latest CMake changes and force CLion to reload the project to reflect them in the editor (automatic reloading can be enabled in Build, Execution, Deployment | CMake settings). Change Project Root is useful in case your project root directory differs from the directory where the top-level CMakeLists.txt is located. Reset Cache and Reload Project allows you to clear the CMake Cache without dropping all of IDE indexes and caches. If you use Rename refactoring Shift+F6 to rename user symbols in CMake (like functions or macros), all the usages will be updated automatically. If you have any CMake install targets in your project, you can call Install from the CLion’s Run menu now. The cmake install command will be executed. Alternatively, you can add an Install step to any of your run configurations in CLion. Create frequently-used or custom code constructs in CMake and reuse them with live templates. Select between predefined templates or create your own. After you finish editing, a banner shows up where you can choose to reload the current project manually, or enable automatic reload on every edit.